We’ve been helping people get out boating in the beautiful Bay of Islands for over twenty years. We’re all mad keen sailors and we love to share our passion for the sport and the sea with you. Between us, we have thousands of ocean miles under our belts and we are all Yachting New Zealand and/or IYT (International Yacht Training) certified instructors. Great Escape’s proven sail training processes can take you from complete novice to competent, confident skipper. Through empowering coaching, clear instruction and excellent support materials we can build your skill set you that you can enjoy a safe, fun sailing holiday in one of the best sailing destinations in the world. Come sail with us. Bill is passionate about boats and sailing. Straight from school into a boat building apprenticeship he has built and sailed boats all around the world. Highlights in his sailing career include winning the Lake Pupuke 24-hour race and winning his division in the two-handed round the North Island race. His current boat the 14m cruising catamaran Synchronicity is his own design and with his family, he has cruised this boat extensively in New Zealand, the Pacific and Australia. He is the MacGyver of the operation; maintaining and continually improving the fleet. 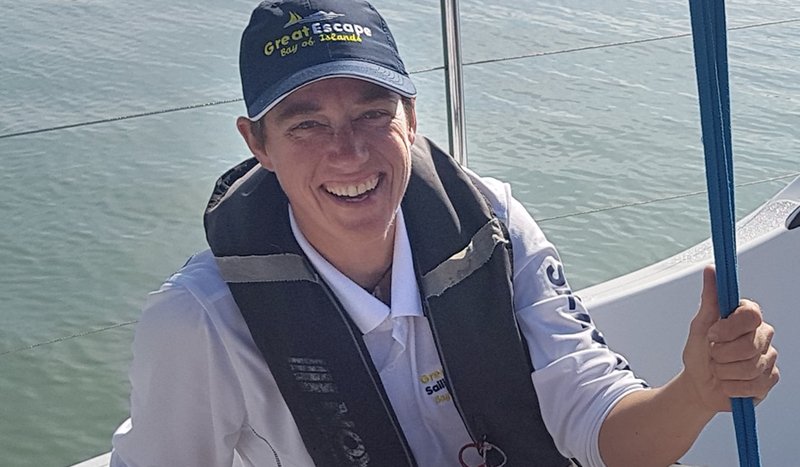 Julie has notched up a lot of firsts as a women sailor. Helming her own 12’Skiff in the Interdominions, two-handed all-women keelboat racing, and women’s keelboat championships. Lucky enough to be introduced to the sport as a child she has sailed a wide range of dinghies, keelboats and multihulls. Most recently returning from another season sailing in the Pacific. Julie pretty much acts as skipper for the Great Escape operation; navigating the challenges of administration and marketing. Daryl is a very experienced instructor and has been teaching sailing and involved in outdoor mountain guiding and education for over twenty years. He has taught in some of New Zealand’s most remote areas. He lives aboard his boat Calypso and spends the winters sailing the Pacific Islands. 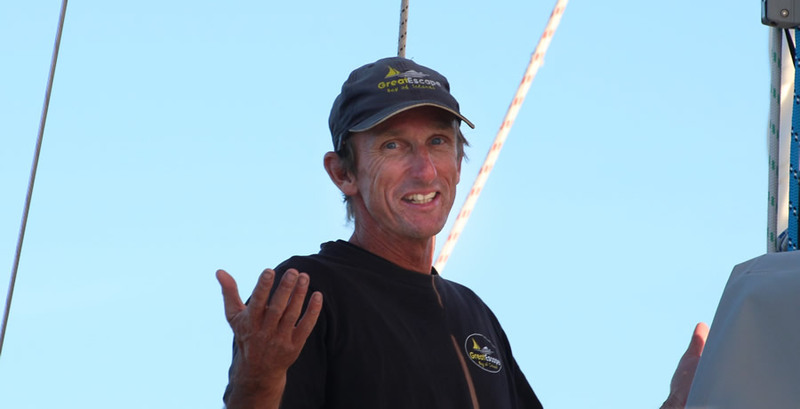 Daryl is a competent and experienced sailor and educator who loves teaching others to sail. His calm, professional style has allowed hundreds of people to safely enjoy the waters of the Bay of Islands. At the age of 20 Martin made up his mind to sail around the world. The small matter of not having a boat, no idea of how to navigate, let alone how to sail, did not stop him. Now after more than thirty years of sailing Martin doesn’t claim to be an expert in yacht racing, but he does possess a solid knowledge in anything that revolves around cruising in yachts; from finding the best anchorage for the night, to reading the wind strength and direction of the surface of the waves. From the history of the Polynesian and European sailors to the weather forecasts, through observing the clouds and the wind direction. He would love to show you the ropes, and we know when teaching sailing, sparks of Martin’s sailing enthusiasm jump over, and just maybe they will kindle the fire and love for boats and the sea in you. 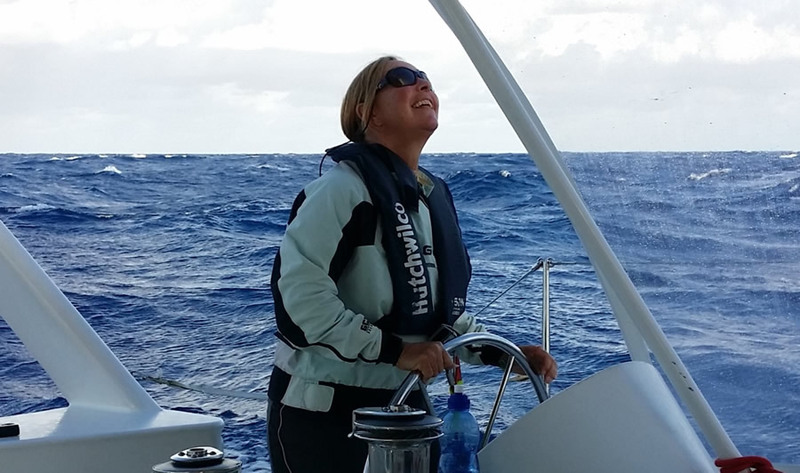 Antje’s passion for the sea dates to her earliest years cruising the North and Baltic Seas with family. A keen interest in dinghy racing after starting in an Optimist at age six, she has New Zealand National Titles in the Javelin Skiff and Europe Dinghy classes and won a heat at the International Europe Class World Championships in 2018. Antje lives aboard Sarrie, her cruising has taken her around the North Island and up and down its East and West Coast several times. Let her introduce you to the adventure that has created so much joy in her life! Ian sailed from England to New Zealand with his wife Merry and, fortunately for Great Escape and our sailors he decided to stay. Ian is a delight to sail with – calm, capable and never flustered. 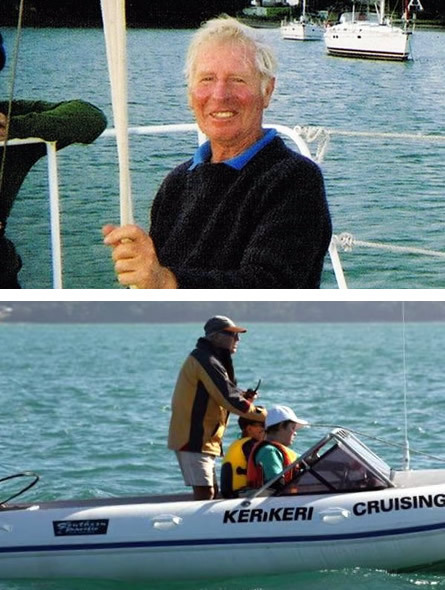 He is an ex Commodore of the Opua Cruising Club and regularity races his own keelboat “You Two“, he has been known to snaffle our sailors to crew for him in the local club racing. Lewis never had a choice about sailing; the offspring of passionate sailors he has had to sail across oceans, live aboard a boat, race up and down the coast, and now (by personal choice) sails for fun, continues to race and teaches others to sail. 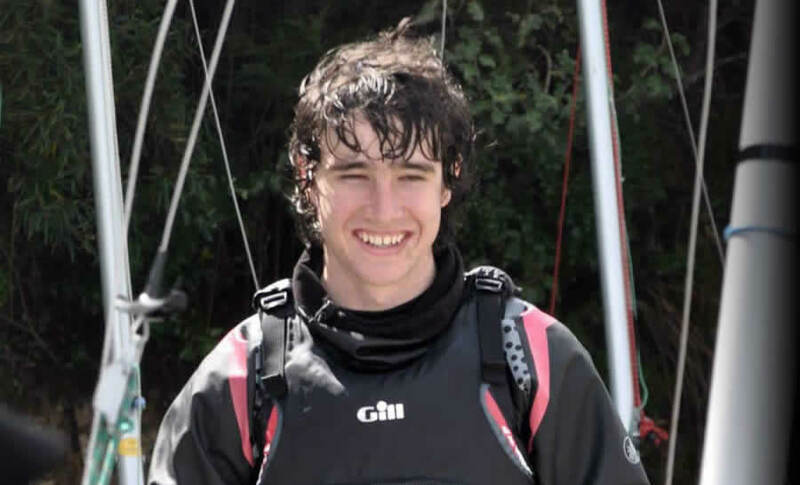 Whilst at high school his team won the National Teams Racing competition, now studying Engineering at University when not in the Bay he also coaches Learn-to-Sail centreboards in Auckland. Bernd started sailing quite early buying his first boat at seventeen. At 24 he left Europe on an engineless 27 ft sloop and sailed across the Atlantic to Brazil and the Caribbean. 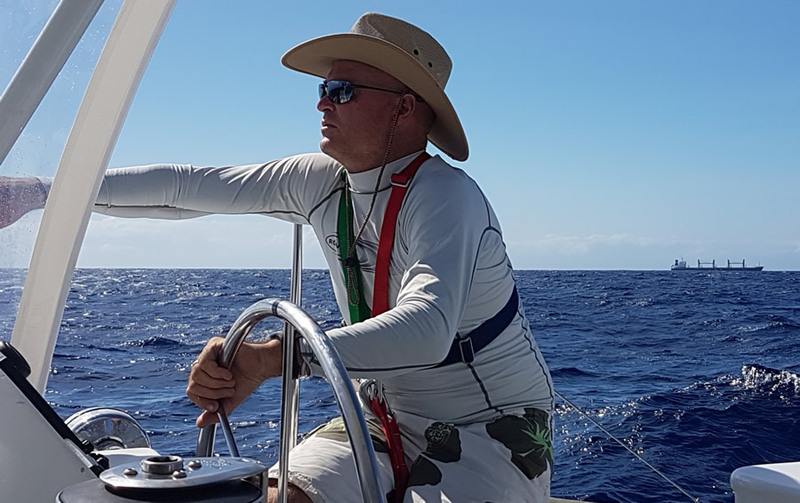 After working in the Caribbean as Charter and Delivery Skipper, including 22 deliveries from the British Virgin Islands to the US Mainland, Bernd sailed to NZ met his wife Janet. They both sailed back to the British Virgin Islands where they ran a 50ft Charter yacht for a few years. Back across the Pacific back to NZ in the last 14 years Bernd has taught PE at KKHS and managed to sail to the South Pacific Islands every second year or so. Cruising the NE coast of NZ from a very young age, Diane developed a passion for the ocean, adventure and travel. She has been a competitive sailor in dinghy and keelboat classes, competing internationally. Studying marine science, she has followed her path around NZ and Oz researching changes in the ocean environment. 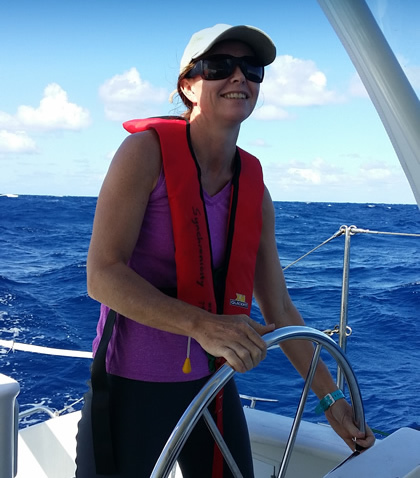 Moving into tourism and education Diane has taught sailing and SCUBA diving while travelling the Caribbean, Med and Pacific (onboard Windstar Cruises). She has been teaching Sailing for 20 years, working in clubs and locally at KKHS. Currently, she is the Senior Dingy Instructor at TSC in North Queensland. Diane joins us for the summer to reconnect with family and some of her favourite places in the bay. Favourite cruising destination in the Bay of Islands “Waewaetorea island” Going Global – “Magnetic Island” both as beautiful on the surface as below! 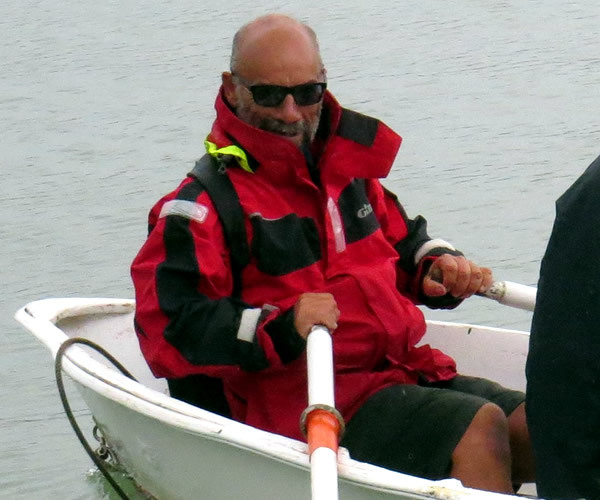 Yachting New Zealand Life Member, guru, sailing coach of champions. Ex-Commodore of Kerikeri Cruising, YNZ Academy Coach, Commercial Launch Master. A legend in the sailing world, Derry has coached and developed many champion sailors including winning school teams, Olympic sailors, and many of the key members of our current America’s cup winning Team New Zealand. His own keel boat experience includes RORC races; Fastnets between 1955- 63 and 1968 – 72. He sailed a Sydney Hobart and cruised to Fiji and around Tonga between 1964 and after 1976. 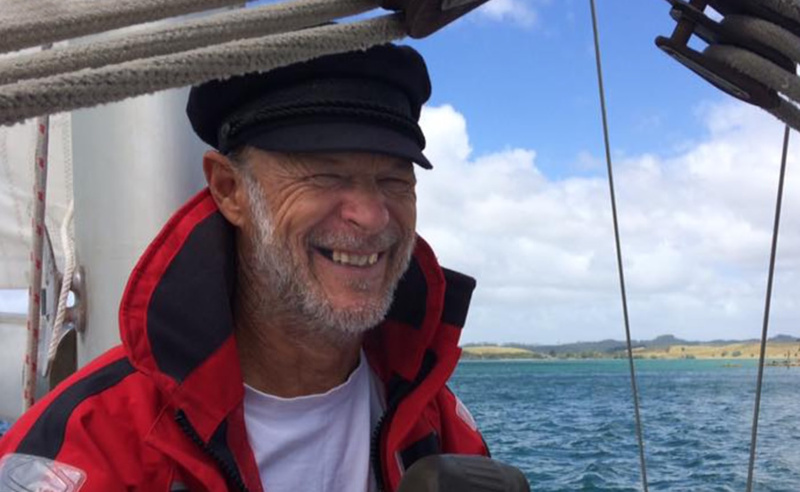 Since retiring from school teaching in 1996 he has been full-time coaching sailing and running YNZ courses for dinghy and keelboat instructors, he has also written five units for the NZQA in practical dinghy and keelboat sailing. 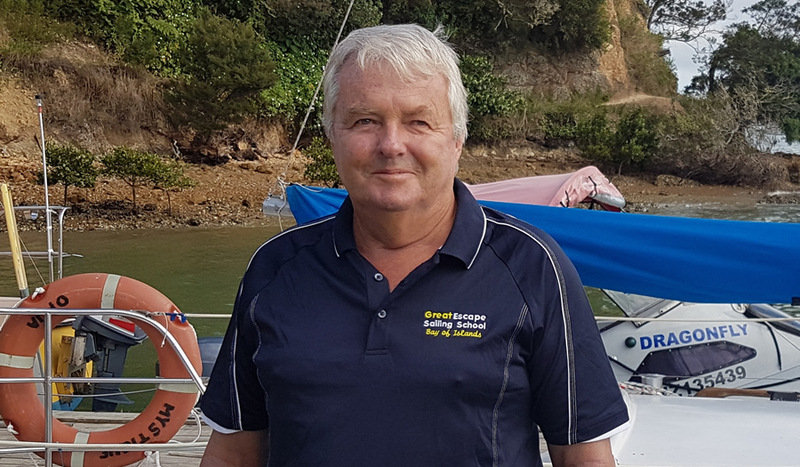 A past Commodore of the Kerikeri Cruising Club, Derry is also a successful teams racing coach, taking the KKHS team to six national titles and four Interdominions. He also coached the NZ National team who won four podium places over six events. Derry is currently Chair of New Zealand Team Sailing Association attends and helps at all NZTSA regattas. Derry coaches our coaches and the depth of knowledge and experience he possesses in coaching sailing would be unsurpassed. We are very privileged to have Derry’s expertise in Northland, helping the team at Great Escape help others into our wonderful sport.